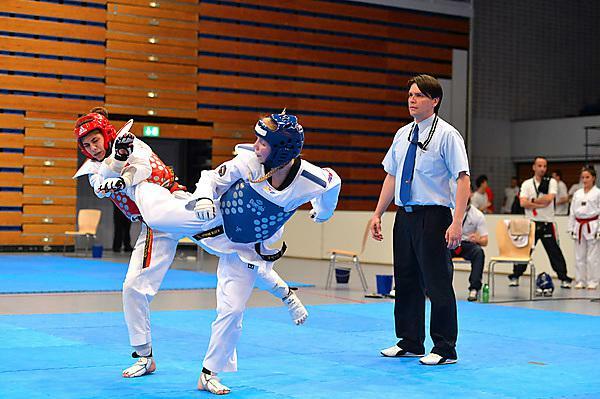 After her industrial year in placement, Katie Bradley returned to the University of Plymouth for her final year in BSc (Hons) Mechanical Design & Manufacture (Engineering) and was immediately back on the competitive taekwondo mats. And it was a successful start at the London Open International at Lee Valley Athletics Centre, culminating in her demolishing her opponent in the final 28-7 and taking home the gold medal. Now a 4th Dan Master, probably the youngest in the country, Katie recently passed her accreditation as a coach, aiming to inspire the next generation to enjoy and experience everything she has in her sport. So the competition was her first time officially stepping into the ring with the responsibility of coaching another student. She coached two students, the first won his match to progress in the competition, and the second won his final against the favoured player and more experienced coach to take gold. Next up for Katie will be The British National Championships, followed by The British Student Taekwondo Federation (BSTF) university series competitions. You can follow Katie’s on-going progress on Twitter and Facebook. In 2014 Katie brought home a World Junior Bronze for Great Britain and became Commonwealth Junior Champion in Edinburgh for Team England. Since moving up and becoming a senior athlete in 2015, Katie has already represented her country four times and achieved Gold in the BSTF National Championships 2016. Most recently, Katie won two golds at the BSTF National Championships 2017 and British Masters Open 2017.